Maintaining traditional methods, Refresh Chrysanthemum Drink is made through boiling carefully selected chrysanthemum flowers. This procedure extracts authentic chrysanthemum flavours and fragrances, and produces the nostalgic tastes we are all accustomed to. 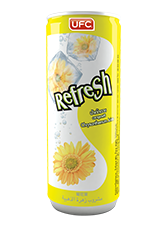 Beyond its flavours, chrysanthemum drinks also offer health benefits such as preventing and curing oral ulcers.